Designed for comfort, the wraparound design provides firm adjustable support for a custom fit. Lightweight and comfortable for all-day wear, allowing user to remain active. Ideal for minor sprains, strains and arthritic knee conditions. By Mueller. Designed for comfort, the wraparound design provides firm adjustable support for a custom fit. Lightweight and comfortable for all-day wear, allowing user to remain active. 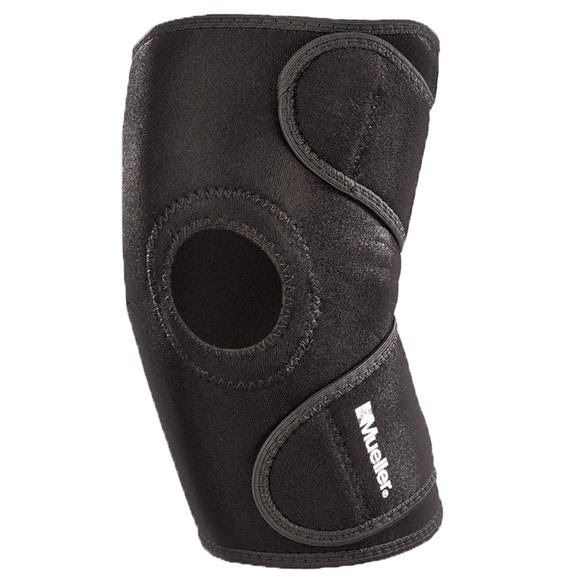 Ideal for minor sprains, strains and arthritic knee conditions. By Mueller . Soft neoprene blend retains body heat for soothing warmth to help relieve pain and keep knee joint flexible. Open patella helps relieve pressure on kneecap. Wraparound design for easy on and off. Fully-trimmed edges with smooth seams for durability and comfort. Fits knee circumference 12” - 25” / 30 cm - 63 cm.